Netflix may have started a s a mail-order DVD rental house, but today, almost every Netflix user focuses simply on the digital streaming service offered by Netflix. From outside third-party entertainment to Netflix’s own original entertainment, the streaming service offers some of the best television shows you can watch today. Whether you’re a binge-watcher or love to take your time with your favorite TV shows, here’s a sampling of the best that Netflix has to offer in the sci-fi/fantasy genre. These are thirty of the best fantasy, sci-fi, and epic fiction you can catch this spring on Netflix. When you’re done reading our list below, you also might want to check out our list of the best sci-fi movies on Netflix. 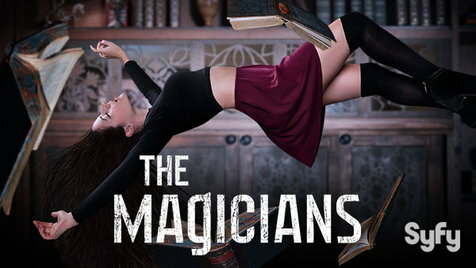 The Magicians takes an adult, intensely cynical look at the tropes of some famous children’s fantasy books. Quentin Coldwater (Jason Ralph) is a graduate student addicted to a Narnia-type book series, who discovers the world of the books is more than just escapism. He ends up at an elite school for young magicians (sound familiar? ), makes a bunch of misfit friends, and ends up transported to the universe of his favorite fantasy novels. Meanwhile his childhood friend Julia (Stella Maeve) breaks into the world of magic by less traditional means. Two seasons are currently streaming on the service, with season three recently having wrapped up on SyFy. After being struck blind as a child during a near-death experience, Prairie Johnson (Brit Marling) is raised by a Midwestern couple (Scott Wilson and Alice Krige)–until she mysteriously disappears for 7 years. When she returns she can see–but she can’t, or won’t, tell anyone how she got her sight back or where she’s been. She enlists a group from the neighborhood, consisting of a teacher and four high school students, to participate in an experiment that can’t be described without serious spoilers. I will say that she wasn’t just missing for seven years–she was abducted by Hap (Jason Isaacs), a doctor who was experimenting on people who had lived through near-death experiences. 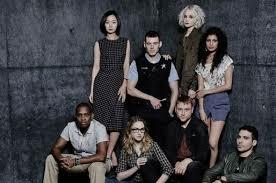 Her fellow captives are an interesting bunch, especially love interest Homer (Emory Cohen). The group Prairie gathers in the neighborhood is the most interesting, however, as each of them had a serious need filled by the group that helps them to grow as human beings. There’s the high school bully (Patrick Gibson), the overachiever (Brandon Perea), the forlorn trans boy (Ian Alexander), and the teacher who needs the group (Phyllis Smith), who probably needs the most help. 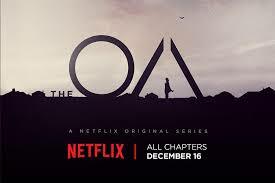 The OA, created by Brit Marling and Zal Btmanglij, is one of those shows I watched all in one weekend because I had to see what would happen. As the season unfolds, the crazy story reels you in with slow-moving suspense that mostly pays off. A second season premiered in March. DC Comics has had better luck with its TV shows than its big-screen adaptations lately (at least until Wonder Woman came out), and Arrow is one of their strongest offerings. Wealthy scion Oliver Queen returns home with incredible archery skills and a desire to fight crime, in many ways representing a small-screen Batman. Arrow has all the makings of great binge-watching, from a brooding protagonist to colorful, melodramatic plotting, and fun secondary characters who absolutely steal the show. Six seasons, including the most recent season, are currently streaming on Netflix right now; season seven will premiere on The CW this fall. This hit show, based on Robert Kirkman’s comic series by the same name, follows a group of survivors through a bleak and violent zombie apocalypse. Deputy Rick Grimes (Andrew Lincoln) is our protagonist, swinging between hero and antihero as he tries to protect himself, his son, and the group that forms around him. The show is at its best when the characters manage to find moments humanity in spite of all the carnage—although some of the carnage makes for great TV, too. The first seven season of the show, following Rick Grimes and his constantly rotating group of friends and followers, are streaming on Netflix. Season eight recently wrapped on AMC; look for it later this year on Netflix. Eight strangers from around the world find that they are psychically linked to each other’s minds, experiencing whatever the other seven feel. This strange but promising premise comes courtesy of the Wachowskis (The Matrix, Cloud Atlas). It shuffles a diverse, interesting cast in creative ways, making for lots of intriguing, unexpected developments. Despite the complicated plot, the fanbase grew a cult following over its first two seasons of production. The show was unexpectedly cancelled after those two seasons, but public outcry from the show’s massive fan base led to the greenlighting of an upcoming two-hour Netflix original movie in 2018 to wrap up the show’s plotlines. That full-length film premiered on June 8th, 2018 to wrap up the show; that film is now streaming. Though the cinematic film debut of The Clone Wars was disappointing, the six-season series that came from it provided some of the best Star Wars action you could ask for. Originally aired on Cartoon Network before finishing its final season on Netflix following Disney’s purchase of the saga, Star Wars: The Clone Wars follows Anakin Skywalker, Obi-Wan Kenobi, and newcomer Ahsoka Tano as the Clone Wars introduced in Attack of the Clones rage on. The early seasons of the show are episodic in nature, showing the toll of battle as the war between the Galactic Republic and the Confederacy of Independent Systems. 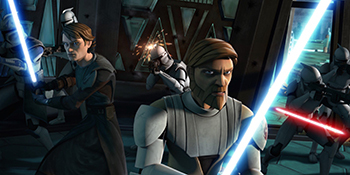 The show was acclaimed for deepening the characters of Anakin and Obi-Wan, and for further explaining aspects of the films like Order-66 and the Clone Army. The series was recently renewed for a seventh and final season after five years off the air, though that season will premiere on Disney’s upcoming streaming service in 2019. Stranger Things is both a loving tribute to 1980s science-fiction and horror, while also telling the story of four children growing up in the ’80s who find their town hides supernatural secrets. The story begins when Will, one of the four boys returning home after a night of playing Dungeons and Dragons, goes missing without a trace, leaving behind a lost girl with a shaved head in his place. With twists and turns, gruesome murders, and a mystery as thrilling to solve as it is to watch play out, it’s no wonder Stranger Things was a breakout hit when it first premiered in the summer of 2016. 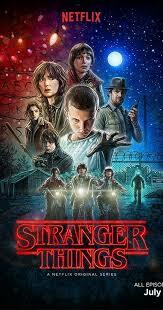 Featuring outstanding performances from Winona Ryder and David Harbour as Will’s mother Joyce and the town’s police chief Jim Hopper, respectively, plus breakout stars Millie Bobby Brown and Finn Wolfhard (who you may recognize from 2017’s It adaptation), Stranger Things is a must-see piece of entertainment. Season two dropped in October of this year, and a third season is already under pre-production. We’ll stop short of calling the show a masterpiece, but if you’re in the mood for some good, old-fashioned fun, there’s plenty to be found here. Season three is on track for summer 2019. Jessica Jones is Marvel’s second comic-based series on Netflix. 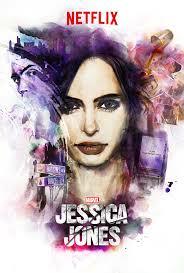 Jessica (Krysten Ritter) is a super-powered private eye who mostly wants to be left alone. The one person who won’t leave her alone is the villainous Kilgrave, an eccentric psychopath with the power to control minds, played by a terrifying David Tennant. Of the four Marvel-based shows on Netflix, Jones might be the easiest to get into: Ritter is wonderful as the lead character, and Tennant shows a side of himself that Doctor Who fans won’t recognize. If you only watch one Marvel show, make it this one—oh, and The Defenders, which sees the return of Jones fighting alongside Luke Cage, Daredevil, and Iron Fist in a war for New York. Two seasons are currently streaming. 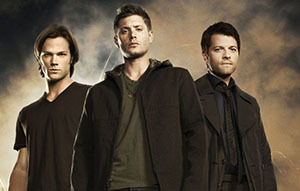 Supernatural is a mainstay in American television. Having premiered in 2005 on the WB, it is the longest-running fantasy-based television show in American history and the final remaining show that first aired on the WB, the predecessor to the CW (other shows, like Gilmore Girls and Reba, only lasted a year; Smallville lasted until 2011 and America’s Next Top Model lasted through 2015). Originally designed with a story to be told over three seasons (later extended to five), the show has run for thirteen seasons and shows no sign of stopping anytime soon. The show follows the Winchester brothers, Sam (Jared Padalecki, Gilmore Girls) and Dean (Jensen Ackles), as they hunt ghosts, demons, and other evil beings from the paranormal world. The show has always been fairly well-received, and the fanbase is rabid for the show. It starts slow, but give it some time, and you’ll find a fantastic serialized-procedural hybrid show to enjoy. 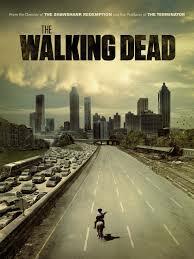 And hey, if you decide the long length of the show isn’t for you, the finale of season five is a great place to end. 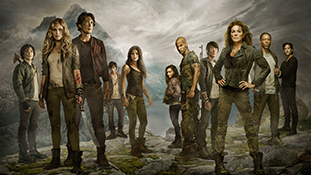 One of The CW’s most popular shows of the last few years, The 100 is based on the 2013 book series of the same name, and follows a group of young post-apocalyptic survivors as they explore Earth for the first time. Set 97 years after a nuclear apocalypse wiped much of the life off of Earth, the remaining members of humanity survive on a space station orbiting Earth, known as “The Ark.” In order to test the habitability of the planet, one hundred juvenile delinquents are sent from the ship to the surface of the Earth, and discover that plenty can change in a century. The show’s early seasons received positive reviews, with some calling the show one of television’s best guilty pleasures. The third season received critical praise, and the first four seasons of the show are streaming on Netflix. 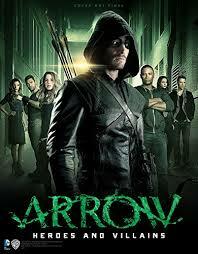 Season five premiered in April on the CW and is now streaming on Netflix; a sixth season is on the way for next year. Charlie Brooker might be best known as a presenter and broadcaster on British television, but Brooker is also the creator of one of the best science-fiction shows on television. 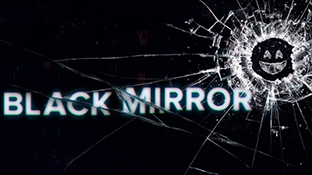 A modern day Twilight Zone, Black Mirror first started airing in 2011 in Britain, but it wasn’t until the series moved to Netflix in 2014 that it began to grow in popularity Stateside. 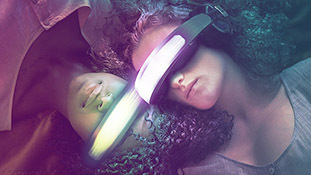 The show, which recently premiered its fourth season, has now hit nineteen full episodes of varying length (ranging from a breezy 41 minutes to a full 89-minute, movie style film), each with different actors, writers, and plot that takes place in a not-so-distant future, exploring our paranoia, our modern society, and how the future of technology might lead us down terrifying paths. Most of the show isn’t meant to be watched lightly, typically featuring a sense of cynicism and dark satire, but a few episodes—”San Junipero” in particular—highlight their happy endings in a way that subverts expectations. If you’re a fan of science-fiction or anthology series, you’ll fall in love with Black Mirror. Definitely check it out. In Kiss Me First, a British cyber-thriller drama series picked up by Netflix for international distribution, we follow Leila, a lonely 17 year old girl who is addiction to an online MMO called Azana, in a similar setting to Ready Player One. While in the game, Leila meets Tess, a cool and charming girl who loves to party, but secretly harbours a dark secret. Meanwhile, in the real world, the two girls meet and become friends, but after Tess disappears, Leila is quickly drawn into a mysterious conspiracy behind Tess’s disappearance. The show is based on the Lottie Moggach novel of the same name, and uses a mix of live-action and CGI to interpret the real world and the world of Azana. The show is six episodes long, each clocking in at about an hour, and though the CGI isn’t up to par with what you might expect from such a cinematic premise, the show is a solid young-adult effort from Channel 4 and Netflix. The Mikaelsons move to New Orleans and form an alliance with local witches in an effort to rule the city once again in Julie Plec’s The Vampire Diaries spinoff. Klaus Mikaelson (Joseph Morgan) is the original vampire-werewolf hybrid who, along with his brother and sister, Elijah (Daniel Gillies) and Rebekah (Claire Holt), returns to his home city of New Orleans after being exiled for a century. 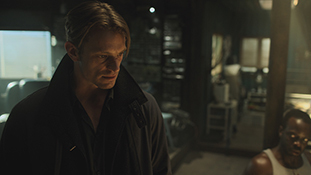 Also appearing in the French Quarter is pregnant werewolf Hayley (Phoebe Tonkin), searching for clues to her family history. Klaus’ rival and protege is Marcel (Charles Michael Davis), the vampire who has taken over as leader in Klaus’ absence. When animal species all over the world begin attacking humans, controversial zoologist Jackson Oz (James Wolk) tries to discover the cause of the sudden change. 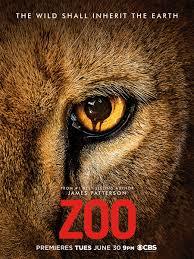 Zoo was created by Josh Appelbaum and is based on the novel by James Patterson. Jackson Oz and Abraham Kenyatta are African Safari guides who begin to notice animals are acting strangely. In Los Angeles, halfway around the world, animal attacks are also on the rise. In addition, house cats are disappearing. A reporter, Jamie Campbell (Kristen Connolly) believes a corporation called Reisden Global is to blame. She teams up with a veterinary pathologist, Mitch Morgan (Billy Burke) to figure out what’s happening. 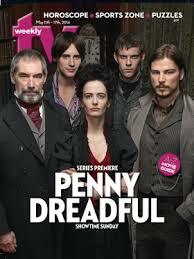 This is a fast-moving show with a global scale, with the characters always in peril. To make the animal attacks convincing, CGI takes a backseat to the use of real animals. Zoo is definitely worth watching. Liv, medical student-turned-zombie (Rose McIver), gets a job in a morgue, where the dead bodies are aplenty. As she tries to retain her humanity, finds she has an uncanny new gift for solving crimes. Many of the bodies at the morgue are murder victims, and Liv gets clues to what happened as she eats their brains. She puts the insight to good use and helps the police department solve crimes. 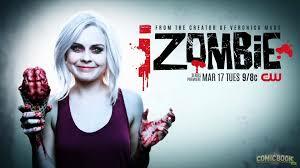 iZombie makes for relatively lighthearted, refreshing zombie fun. Adapted from Susanna Clarke’s best-selling fantasy novel, this seven-part BBC miniseries features BAFTA-winning visual effects. Set in England in the early 19th Century, during the Napoleonic Wars. In this alternate history, everyone knows magic exists, but for the last three-hundred years hardly anyone has practiced it. Mr. Norrell (Eddie Marsan), a brilliant but arrogant practicing magician, comes to London to change that. Once there, he meets another practicing magician, Dr. Strange (Bertie Carvel). So begins a dangerous battle between two great minds. 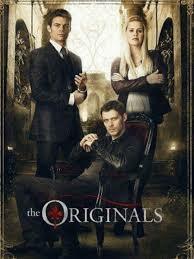 This hit series is still running on the CW, where it’s in its eighth season. The Vampire Diaries stars Ian Somerhalder (Lost), and was created by Kevin Williamson (Dawson’s Creek). A pair of vampire brothers, Damon (Somerhalder) and Stefan Salvadore, are both in love with the same human girl in Mystic Falls, Virginia. Her name is Elena Gilbert (Nina Dobrev), and she’s a dead ringer for Katherine (also Nina Dobrev), the 500-year-old vampire who turned the brothers 150 years ago. Like moths to a flame, the brothers return to Mystic Falls to be near her, in spite of having been estranged–for good reason, it turns out. The good brother, Stefan, refrains from drinking human blood, preferring to live on squirrels and rabbits and maybe the occasional deer; Damon, the bad one, drinks human blood with gusto and wreaks havoc wherever he goes. Of course, the innocent Elena falls head over heels for Stefan. Damon, in the meantime, starts an affair with Elena’s peppy friend Caroline (Candice King), who doesn’t know she’s being compelled. Then there’s Bonnie, the witch (Kat Graham) who’s ancestors escaped the Salem witch trials and settled in Mystic Falls. 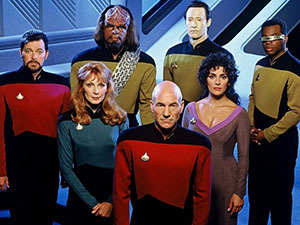 This is the show that took Star Trek from the adventures of Captain Kirk and company to an enduring, multi-ship and multi-crew franchise. It also introduced audiences to the stalwart Captain Picard (Patrick Steward) who, let’s face it, is much better at being an actual captain than Kirk was. Next Generation follows a new starship Enterprise on adventures throughout the galaxy with various aliens and exotic planets. It takes a few seasons to get going–you may want to skip the first season entirely–but the series is littered with classic episodes as it develops. Based on the novel of the same name by Richard K. Morgan, Altered Carbontakes place in 2384, placing viewers in a cyberpunk reality not far off from films like Blade Runner or last year’s sequel, Blade Runner 2049. In this future, the memories of each person have been separated and placed in “cortical stacks,” storage devices originally designed by aliens that have been mass-produced and placed into the vertebrae of the neck of every person. With bodies now functioning as a shell for the human consciousness, the physical part of ourselves—now called “sleeves”—have become disposable. The story begins when Takeshi Kovacs (Joel Kinnaman, Suicide Squad) wakes up 250 years following the last removal of his previous sleeve, and is given the choice to spend the rest of time in prison for his crimes, or to help solve a murder case. The show was recently renewed for a second season, with Anthony Mackie taking over for Kinnaman in the lead role. Lost in Space has a long history of reimaginings. This new Netflix original series is a remake of both the 1998 film and the 1965 series that the film was based on, with all three properties being adaptations of the 1812 novel The Swiss Family Robinson. The story begins when a celestial object, the Christmas Star, crashes into Earth and threatens to wipe out civilization, leaving mankind forced to evacuate the planet and look for a new place to call home. The Robinson family is selected to be placed on the outgoing ship, christened the Resolute, but before they can reach their destination, an alien robot destroys the hull of the ship. The Robinsons, now crash-landed on a nearby planet, are forced to reckon with their new environment while also dealing with their own problems along the way. 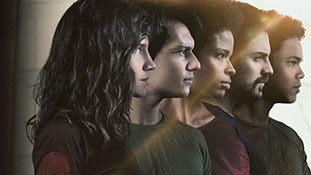 The show has been renewed for a second season. A British Netflix Original, The Innocentsis a dark and broody teen thriller, a solid companion to the likes of 13 Reasons Why combined with supernatural elements. The series begins as teenagers June and Harry decide to run away, seeking escape with each other from their troubled and abusive home lives. As they begin to rebuild their new life, they’re confronted by a man claiming to be sent by June’s missing mother. Things take a terrifying turn as June begins to realize she might have powers she never knew she had. The series is perfect for anyone eagerly awaiting the premiere of Chilling Adventures of Sabrina this fall on Netflix. One of the hottest new series from last fall, NBC’s The Good Place tells the story of Eleanor Shellstrop, a woman who’s woken up to find she’s dead and in heaven—or rather, “The Good Place,” as it’s called. Kristen Bell plays Eleanor, a woman who finds herself in a place she doesn’t deserve to be. 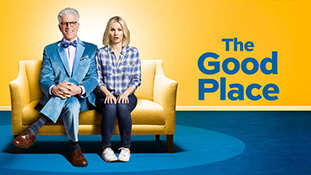 Also starring is Cheers’ alumni Ted Danson as Michael, the creator of “The Good Place,” a man trying to make his residents as happy as possible in the afterlife. This series comes from creator Michael Schur, fresh off co-creating both Parks and Recreation and Brooklyn-99. Any fans of his previous work—he also wrote and acted on The Office, where he played Dwight’s cousin Mose Schrute—will find plenty to love here. Just don’t read too much into the plot online—serious spoilers abound. Seasons one and two is currently streaming on Netflix; season three will premiere this September on NBC. Despite being Brazilian and using Spanish with English subtitles, 3% is one of Netflix’s most popular original shows to date. The show is set far into the future, where the majority of the population lives in complete poverty on what’s known as the Inland. Each year, every 20-year-old gains the opportunity to make it off the Inland and to head for the Offshore, a rich and affluent society, by going through a series of tests called The Process. Only three percent of each year’s applicants make it. The show follows Michele, an applicant for the test who was raised by her brother, who went missing after trying the Process. In the first episode, Michele and her best friend Bruna are led to a remote location at the start of the Process, where it’s revealed that one of them is suspected of being a mole for a rebellion called The Cause. When Michele convinces Bruna to attack the interrogator, she’s killed and assumed the mole, allowing Michele—the true mole—to continue through the Process. The second season recently premiered on Netflix, and the series was renewed for a third season. From Matt Groening, the series creator behind The Simpsons and Futurama, comes his third original animated series—this time, set in the past. 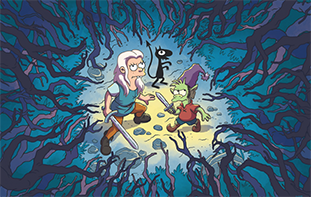 Disenchantment is an animated comedy set in the wonders of the Middle Ages. The series, which premiered in August of this year with a 10 episode first season, follows Bean, an irresponsible and alcoholic princess of the kingdom of Dreamland who constantly gets herself in trouble with her father, the king. With an all-star voice cast including Abbi Jacobson, Nat Faxon, Eric Andre, and Futurama alumni John DiMaggio, Billy West, David Herman, Tress MacNeille, and Maurice LaMarche, the series is absolutely worth seeking out—especially if you’re more into the plot-heavy elements of Futurama. A second part of the first season, which will include ten more episodes, should be out sometime this year. 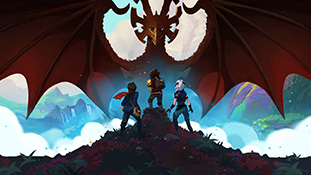 From Aaron Ehasz, the head writer of Avatar: The Last Airbender, and Justin Richmond, the director of Uncharted 3, comes The Dragon Prince, an original fantasy tale designed to fill the same void of comedy and action for families designed 15 years ago by Avatar. Set in a fantasy world where humans and elves battle it out in war, the story begins when the elves attempt to murder the human king Harrow and his heir, the young prince Ezran, in revenge for the human murder of the dragon king and his egg. When the young elf Rayla, along with Ezran and Callum, discover the dragon king’s egg wasn’t destroyed, they attempt to return the egg to the dragons to prevent war, only to be challenged by Viren, a mage who is intent on starting a war with the elves. Despite a controversial animation style, the show proved to be popular, and two seasons are currently streaming. 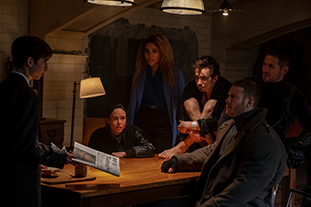 Based on the graphic novel series by Gerard Way, former lead singer of My Chemical Romance, The Umbrella Academy tells the story of a group of seven infants adopted from a group of 43, inexplicably born to random, unconnected women who showed no signs of pregnancy on a single day in 1989. Billionaire industrialist Sir Reginald Hargreeves takes the children and creates the Umbrella Academy, preparing his “children” to save the world. In their teenage years, though, the family fractures and the team disbands. Fast forward to the present time, when the six surviving members of the clan reunite upon the news of Hargreeves’ passing. They work together to solve a mystery surrounding their father’s death, but divergent personalities and abilities again pull the estranged family apart, and a global apocalypse is another imminent threat. 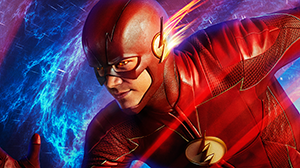 Often considered one of the best of The CW’s Arrowverse shows, The Flash was the second DC show created by Greg Berlanti and his team of writers, following the success of Arrow. The show has a lighter tone than its older sibling, using The Flash’s humor to its advantage to tell the story of how Barry Allen became The Flash. Glee‘s Grant Gustin stars as Allen, a forensics expert who is struck by lightning following an explosion in the S.T.A.R. Labs particle accelerator. When he awakens following a nine-month coma, he discovers he can move at a superhuman speed, and becomes the superhero known as The Flash. The first two seasons were critically-acclaimed upon release; the third season also received positive reviews, albeit slightly lesser thanks to a messy multiple-universe plot. The first four seasons are currently streaming on Netflix, and the show has been renewed for a fifth season to air in the fall. Would you be surprised if we told you that the best DC show airing on The CW right now wasn’t Arrow, or The Flash, or even Supergirl? 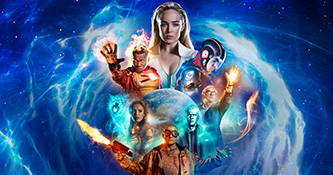 Legends of Tomorrow premiered to mixed-but-positive reviews, with the series taking some B-level and C-level superheroes from the world of DC, including Firestorm, Atom, Hawkgirl and Hawkman, and Rip Turner. The series begins when Rip Turner, a time master, goes rogue following the murder of his family by Vandal Savage, a criminal and supervillain. Determined to stop the murder of his loved ones, he assembles a team from throughout time in order to save the world. The series is a bit more lighthearted than its contemporaries, and following positive remarks for the first two seasons, season three received critical acclaim for its sense of adventure, fun, and heroism. All three seasons are currently streaming; the show has been renewed for a fourth season on The CW sometime in the fall. A sequel to Sam Raimi’s original low-budget horror films, Ash vs. Evil Dead is a horror-comedy in the style of Evil Dead II and Army of Darkness. 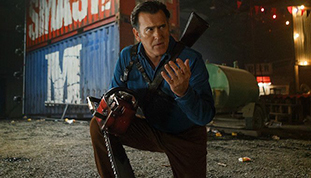 Bruce Campbell returns from those films as the titular Ash Williams, now working as a middle-aged stock boy at Value Stop. Though he’s spent nearly thirty years drifting from town to town trying to escape his past, the evil of the Necronomicon—the book that releases all hell in the original trilogy—continues to haunt him. Unable to destroy the book, he’s become the caretaker, trying his best to ensure that it never falls into the wrong hands. Unfortunately, it seems the evil dead has yet to rest. Sam Raimi co-created the series with his brother Ivan and producer Tom Spezialy, and the Starz series still retains the same dark combination of humor and horror the films had. Any fans of Evil Dead will need to check out the show on Netflix. The show recently wrapped its run on Starz; we expect the third season to arrive on the service sooner rather than later. Look up the show Journeyquest on Amazon Prime. Imagine if Lord Of The Rings was a comedy, and Gandalf was a bumbling failure trying to prove is worth as a wizard. One of the best streaming fantasy comedies around. It’s also on YouTube, but the quality and edit on Amazon Prime is way better. That’s like saying you wouldn’t watch Titanic because someone told you the ship sank. Merlin is the story of King Arthur. The ending is so well known it’s not actually a spoiler. I need more Merlinnn! Why did Arthur have to die? I can’t just pretend that Avalon High is it’s sequel forever! Amen!! We were so upset when they ended it like that. There was so much left that could’ve been done. They already deviated from the legends enough, and mentioned that everyone has multiple life paths quite a few times, that they really could’ve had Arthur survive and create that world they kept saying he was going to create. Or they could’ve even ended it with Gwen having a son and naming him Arthur. SOMETHING! I just finished all 5 seasons of MERLIN and I loved it. Arthur, Morgana, Dwaine and Mordrid died it ended on a sweet sad note. Also checkout shadowhunters as well. Its so good!!! that show is really good! Shannara Chronicles is also good as dives into the narnia-like qualities that The Magicians also carry. Sci-fi shows… Sure, sure. Vampires are sci-fi now. Sure. It says sci fi and fantasy in the title….. Even then, though, Vampires are indeed science fiction as that is not just limited to technology but also biology. I want a season six for after Arthur dies. Honestly that was the saddest show ending I’ve ever seen. I completely agree. Watching Merlin waiting for Arthur was heartbreaking… One of the best shows I’ve ever seen honestly.